When baking cookies, the logical thing to do is bake all of the dough, all at once, right? In our house, if I want cookies to last for desserts for more than two or three days, I have to keep the cookies from getting "snacked-up". Sometimes I bake all the cookies and freeze half. Other times, as with chocolate chunk cookies, where they're at their best freshly baked (with melty chocolate), I freeze half of the dough, to bake at a later date. That's what I did this past week, which really pleases the melty chocolate-lovers in my family. I roasted a whole turkey, my last one from November 2014. We made 5 dinners and 1 lunch from the turkey, plus froze enough turkey for about 6 more family dinners/lunches. And now I think I can do without turkey for a couple of months! My favorite turkey meal this week was the sandwich supper. You read Thursday's entry correctly. We did have applesauce and apple pie last night. Thursday, a friend brought over 2 large grocery sacks of apples, which we turned into pies and applesauce. She's coming back later this morning for us to process the other half of the apples. Another very busy day. And now to find more space in the freezer. Yikes!!! Mmm...got to love those turkey leftovers! I made our last turkey on Labor Day, so we had turkey potpie last week and a turkey soup this week, plus a lunch each of turkey/mashed potato leftovers for hubby and I. It was a smallish turkey, though, 12-13 lbs. I usually go for the big ones but this size was all that was left when we found them on a markdown after Thanksgiving last year. All those apple goodies sound delicious! You will enjoy those come fall. I know -- I love how easy the turkey leftovers make preparing meals. Your turkey leftover meals of pot pie, soup and with the traditional potatoes sounds so fall-like, even though I'm sure it's not at all feeling like fall weather there! I do like the smaller turkeys, myself. I think they're more manageable, and because of their smaller size, I'm more inclined to work hard at getting every last scrap of meat off. My favorite size is right around 16 to 17 lbs. But this past year, it seemed like 19-20 lbs was all there was available when I was picking through turkeys. Keeping my fingers crossed for good turkey deals this year. We made 10 qts of applesauce yesterday and 4 pies. We have at least as many apples to go through today. We're talking about doing chopped apples for cobblers, more sauce and maybe 2 more pies. I'll have to take something out of the freezer to store the rest of these apple goodies! I wish I could send some your way! Everything sounds delicious -- the turkey and biscuits look yummy. I make something similar but like to use sweet potato biscuits on top. So. Good. Comfort food for sure. I am with you on freezing the cookie dough -- since it is just my husband and I, it's best for our waistline if I only make a few cookies at a time. It's also really nice to have a batch of cookies in the freezer if I have an unexpected need to bring a dessert to a gathering. Apples! Probably the fruit I miss the most now that I am a southern lady. We will be traveling to visit family over Thanksgiving and I will do my best to eat as many apples as possible while there. You asked yesterday about my plans for a fall garden. Right now I am thinking of planting kale, chard, basil, sweet lettuce and green onions. I do have a number of herbs growing rather wildly, so that at least has been a partial success. We've had so much rain lately that I haven't had much of an opportunity to get out and work in the yard; I hope it lets up soon! oh yum, sweet potato biscuits would be very yummy. I'll keep that in mind -- a great way to sneak in another veggie! Oh those veggies you're planning to plant sound like they'll do well in winter there. And you have variety, even in just 5 items. You have salad ingredients, cooking greens and a couple of flavorful items in the onions and basil. Good planning! and those items shouldn't take a lot of extra work. I love growing kale, here. It does well and requires minimal fussing. And as a bonus, it can be added to smoothies. One daughter wanted some added this morning to her berry smoothie. I was able to just go pick a few leaves and add them at the last minute. I didn't taste it (it had milk in it) but she did and said it tasted good. Wishing you much success with you garden this winter! I'm a casserole girl--your turkey and biscuit bake is making me hungry right now! Kris, I think we're kindred souls. I'm also a casserole gal and there's nothing better than frozen cookie dough. However, the raw egg part deters me these days. I used to do the same, when my mom would freeze baked cookies. That only marginally slowed me down. But with frozen cookie dough, I seem to be less likely to eat it frozen, for some reason. So, you do what works, I guess. However, all of this does considerably slow down the cookie consumption with others in the house, as only I can seem to find anything in the freezers! Ahhhh, the beauty of being disorganized!! All part of my master plan. I'm beginning to feel the same way about raw eggs, and doughs/batters. It may taste really good, but not worth tummy ache or worse. It's exactly why I won't make my own mayonnaise with raw egg. I've seen recipes for cooked egg mayo. I might try one of those some day. When I make egg nog at home, I do a cooked version -- and use a thermometer. Lili, Do you freeze any of your apples as pie filling? My brother-in-law, who's famous for his apple pies, freezes apples in batches to go into pies. Then all he has to do is add it to a crust (which can be frozen rolled in wax paper). That might save some space in your freezer. Yesterday, when my friend came back, that's what we did with about 1/4 of the apples. We sliced and chopped apples to freeze for pies and cobblers/crisps. We were just running out of time and energy to do anything else, at that point. I keep disks of pie pastry dough in the freezer. I make enough dough for 5 single crusts at a time. All I have to do is roll them out, and fill. I wanted a frozen pie, though, on hand, for last minute invites after church or some such thing, to just pull out and thaw/heat, so I did freeze one whole pie. I'm glad to hear your brother-in-law also freezes the pie filling, and that it works well for him. that's very good to know! Are you home canning? apple items are water bath friendly. I didn't realize that. Thanks for the info -- that's very helpful! Twelve meals for a family of 5 from one turkey is just wonderful. We usually cook our turkey kalua style (salt, liquid smoke) and immediately freeze what we don't eat into servings portion for a meal. We can make instant meals by stir frying the kalua turkey with cabbage (yum!) or eat in sandwiches. Very versatile frozen that way, since it is flavored and ready to use. 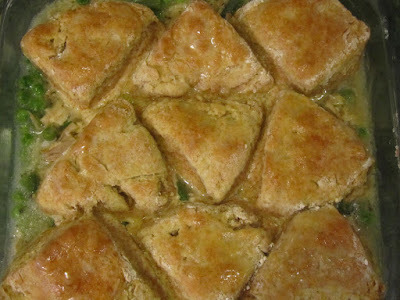 The turkey- vegetable biscuit bake looks so yummy, bet it was better than pot pie!! I sometimes freeze chopped turkey in teriyaki sauce. Then I can do as you do, make quick stir fry, by adding cabbage, peas, broccoli or kale. It was a 20 pounder. 3 of the meals will be turkey soup or turkey and dumplings (already in flavored turkey stock), of the other 3, 2 were slices in gravy, so all I do is heat it up, and the 3rd is sliced for more of the sandwiches, as we had on Monday. Leftover turkey really does make for easy meals. Our family doesn't eat large portions of meat at one sitting. I usually get a comment from at least one family member when I have served too much meat. And for myself, I can't comfortably eat those Costco beef patties that are about 1/3 of a pound, just too much meat for me. So, a 20-lb turkey will give us many meals. It's different for each family, I know. Some of us grew up eating more meat than others, and so I think it feels right to eat a certain amount. not that any one way is better than another. Certainly, eating less meat and more beans will save money, but that doesn't mean one way is better, as there are many ways to save money on groceries, not just cutting back on meat. In November, do you also find good sales on turkey, in Hawaii? It's hard to imagine, but I guess there could be a turkey ranch/farm on the Islands. I would think that a turkey that had to be shipped there would be costly, and not the 49-59 cents/lb I've become accustomed to. Same here, we are not big meat eaters and as you said, it may have to do with what we ate growing up. The high meat prices sure are training lots of kids to eat less meat now and in the future lol. I know our food bill would be twice higher if we ate average portions of meat protein. We eat our salmon scraps (does sound bad but the fatty parts by the belly and fins are so delicious) in between the bean dishes so we are getting a fair amount of protein. It is not that we must eat good protein sources everyday. Our body doesn't require that fortunately. It works more like a bank account and proteins can be stored until needed. Usually we buy at least 2 turkeys on sale in November. It used to be a good deal like 49-59 cents but last year the prices seemed higher. The turkeys are shipped in, but are loss leaders for stores as they compete for holiday meal shoppers. I think a lot of merchandise, including clothing, are pretty good bargains here because of the high cost of shipping....I think stores clearance their merchandise drastically because they have nowhere to send the unsold merchandise. My son worked at our local Woolworth store during high school and he told us the store literally throws away merchandise rather than clearance too steeply or donate. We chose to forgo turkey altogether. We are not big on holidays and for the past nearly 10 years have spent our winters out of town. For many reasons, we fell into this pattern...every year we say it is our last, but around April/May we think we'll miss it too much so plan another trip. Las Vegas is the cheapest destination that we know of, and like you we have accumulated enough perks to fly free. Being Vegas, there are comps and cheap food. Over the years, our trips got longer, the comps fewer, and prices higher overall. This year might be our most expensive, but it might also be our very last for a long while. I am wondering about turkey prices this year, due to the virus which infected a lot of poultry this past year. I'm hoping it's not too bad. But if it is, we will buy fewer turkeys for the year. Pork prices have been good recently, so that's more of an option. We'll figure things out when we know more, I guess. You know, those Vegas trips have their value, as a escape every year. I feel the same way about an escape some time every winter, for some sunshine. I work it into the budget. Sure, it would be cheaper not to go, but so long as we're not doing without the essentials of life, then this is a luxury that we can afford. Like you, I do without other costly things, so that we can afford this. And also, like you, every year, I tell myself, this will probably be the last trip for years. But then I find I need it. It gives me something to look forward to, that doesn't involve a lot of work. I may look forward to Thanksgiving and Christmas, but I also know that there will be a lot of work on my part for those holidays to "happen" at our house. Whereas, with a vacation I can suspend some of my usual chores and behaviors for a few days. I have heard that about everything costing more in Vegas these days. No more super cheap buffets or hotel rooms. Well, maybe another destination will pop up as the cheap place to go, soon. Your Turkey-Vegetable and Biscuit Bake is so pretty, pretty enough for a cookbook cover. Your dinners sound good, especially Friday night. Makes me want to make a Thanksgiving dinner to eat. My favorite part is the dressing.